Originally published at ActiveHistory.ca on April 15, 2014. Few Canadians missed the news stories of grain piling up on the prairies and denunciations of the system’s failures. 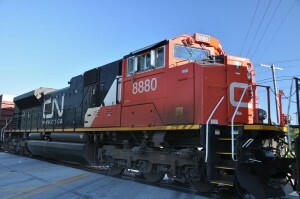 The Federal government’s recent announcement of financial penalties for the railways is the latest act in a long running problem facing western Canadian grain farmers: how to economically get their grain to market when long stretches of prairie and three mountain ranges stand between them and the ocean ports that export about seventy per cent of western Canada’s grain. Economically exporting prairie grain is a complicated relationship between farmers, elevator companies, railways, and port terminals all of whom have conflicting interests which have been a wellspring of conflict since Confederation. Canada consistently produces around twenty per cent of the world’s tradable grain. While many other countries grow grain, only Argentina, Australia, the United States, and Ukraine regularly produce domestic surpluses which can be exported. Competition among these nations for their place in the international grain market is fierce. Like all bulk commodities, grain’s cost rises with transportation distance. All of western Canada’s competitors are much closer to deep water ports for their grain exports. When grain is not moving off the prairies it means unhappy customers, lost sales, and Canadian farmers who are not getting paid. Since transporting grain by truck is considerably more expensive than by rail farmers favour the shortest distance possible between their bins and the elevator point. The railways also need to generate profits as much as farmers need to send their grain to port via rail. In 1902 Saskatchewan farmers formed the Territorial Grain Growers Association and sued a CPR agent for failing to deliver producers cars so they could load their own grain and bypass the private elevator companies. Their success in this case created the precedent that allowed for the growth of farmer-owned producer car loading facilities across the prairies in the 1990s and 2000s. These were created in response to the abandonment of rural branch lines and the closing of local elevators in favour of high-through-put terminals that accommodated the railways compelling elevator companies to build new centralized facilities while requiring farmers to truck grain over greater distances. Overseeing this system of elevators, railways, and farmers was the single-desk Canadian Wheat Board. Through the permit book system the Wheat Board knew the grade, type, and quantity of grain grown throughout the prairies and could allocate railcars to specific elevator points to pick up the grade of grain needed at port to fulfill the sales contracts it made as the collective bargaining agent of prairie wheat and barley farmers. It provided the logistical oversight necessary to organize the grain handling system to run continuously so the grain crop could move off the prairies to buyers in an orderly fashion. With the removal of the Wheat Board in 2012 there is no organization to handle the logistics of grain movement on the same prairie-wide scale. The grain marketing and handling system was effectively broken into several competing pieces. Grain handling companies, which now take ownership of the farmers’ grain at the elevator, each have to place orders for railcars and organize for a grain terminal to handle the grain on its arrival at port while also arranging sales to foreign customers and ships to deliver the grain. The ships then load at the terminal the grain handling company either owns or uses. If the terminal is emptied of the specified grade of grain the ship is sent back to anchor to wait for another train to arrive at port so it can finish loading. This delay in loading ships caused the reports of long-standing Canadian customers complaining about long wait times and quality assurance problems. Having ships waiting for more grain to arrive also causes penalty (demurrage) charges that the seller of the grain pays when the ship does not get loaded in an agreed amount of time. By offering farmers lower prices the companies can recoup these penalties. Under the single-desk Wheat Board the logistics of quickly loading a ship were easier since the Wheat Board arranged for the ship’s arrival to coincide with the arrival of the required grain at a terminal. If one terminal was empty of a particular grade of grain the ship could move to another terminal since the wheat and barley in all the terminals at a deep-water port were under Wheat Board sales contracts. With the loss of the logistical oversight done by the Wheat Board the new question facing farmers, grain companies, railways, and other players in the Canadian agricultural community is how to solve these problems. At the recent Grain Matters Summit in Saskatoon, economists, farmers, and industry representatives agreed that logistical problems exist but achieving a consensus among groups with conflicting interests remains elusive just as it has for over one hundred years. Laura Larsen is a PhD Candidate in the Department of History at the University of Saskatchewan. Her dissertation explores rail rationalization and agricultural policy under the Trudeau government. It focuses on the tensions between government, farmers, grain companies, and railways created by attempts to modernize the grain handling and transportation system as well as the substantial changes to the underlying structure of prairie agriculture caused by these changes.